How did you pick your Derby Name: I was thinking about my derby name for a while, and then one afternoon, there was Axel Rose singing cheesy November Rain (I love that song) and tataaaa it became November Pain! By the way it perfectly fits together with my derby number (month & year of birth) and Roller Derby is such a bittersweet PAIN! 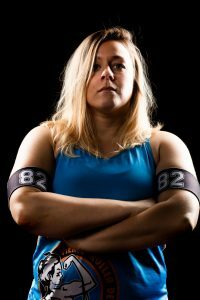 Derby crush (who inspires you and why? ): I love all my teammates for what they are, their strength, passion and their spirit! Can’t pick just one of them! Special love to Dr. CC for infecting me with Roller Derby Fever, being my buddy and my blocker idol! Favourite bout preparation song: Nothing special… everything with a good beat and 90ies trash! Best Derby moment: There have been a lot great ones, but our deBout was definitely the best. Skating and sweating with my lovely teammates in front of my friends and 250 other people in the audience for the first time, was crazy, overwhelming and so much fun!